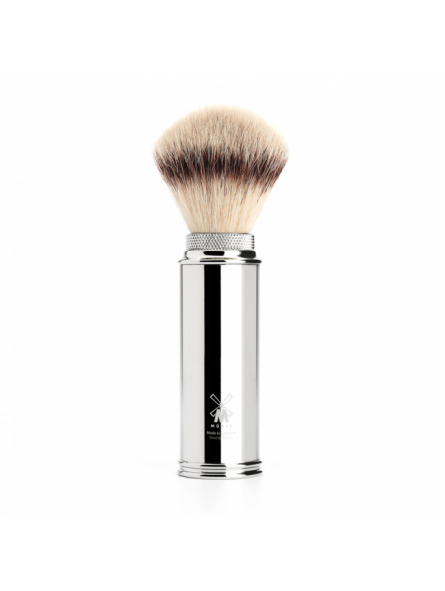 Mühle Travel Shaving Brush Silvertip Fibre. 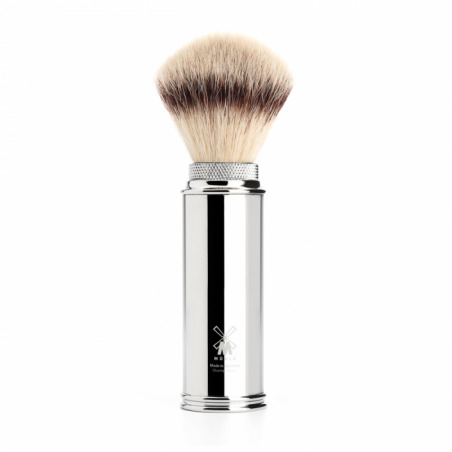 Mühle special range for travel shaving is particularly functional and lightweight. The un-screwable brushes are perfectly protected while travelling in their elegant casings made of anodised aluminium or chrome-plated metal. The bristle load used is Silvertip Fiber®, which dries very quickly and is highly durable. Silvertip Fiber - high-quality synthetic fibers, a world first: a premium quality developed in-house analogously to natural silvertip badger. Silvertip Fibers are tangibly soft, extremely long-lasting and somewhat less sensitive in everyday use as water drips of them and they dry faster than natural hair. The completely vegan fibers are more economically to use, create a particularly creamy lather from shaving soaps and creams but require only half of the amount of medium compared to natural brushes. Their solid fibers make them more hygienic and easier to clean.